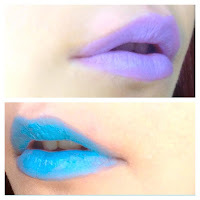 Starrzbeauty: Born Pretty Store Lipstick review: Purple and Blue lipstick! Plus 10% off code and giveaway opportunity! So today is a very exciting day for me! This is my very first post collaborating with a company! A few weeks ago, the lovely people at the Born Pretty Store reached out to me and asked if I would like to post a review on a few of their products. And after having tested their products out for a few weeks, I'm here writing this first review for you guys! The Born Pretty Store sells all kinds of goodies for those who are beauty obsessed! From nail art and makeup to jewellery and stationary, this store has it all. Plus, all of their products are super affordable! When I first had a look round their site, I couldn't believe the prices. And the products I received were all of great quality, which makes it doubly awesome! So the first thing I was sent was two lipsticks! 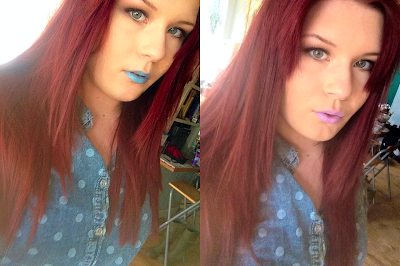 Below is a picture of me wearing both lipsticks. Fun colours, huh? First off, the packaging is fairly good. It's a black, plastic rectangular tube. Now, don't get me wrong, it's not Mac quality packaging, and certainly doesn't have the beauty of YSL packaging. But, for the price, it doesn't feel cheap at all! The plastic is fairly thick and doesn't feel fragile, so it is definitely sturdy enough to keep in a purse. It also clicks shut very securely, which is a huge concern me as I hate it when makeup products pop open in my handbag. Shoddy packaging can really ruin a product, but this packaging does the job perfectly! It also comes in a box in the mail. This may not seem like a big deal to some, but I always feel that when products come in their own box, it feels more luxurious. Now let's talk about the actual lippies! Firstly, the pigmentation is absolutely great! In the lip swatches below, I first outlined the lips with a lip brush then I applied a couple of swipes back and forth from the bullet. So you can see it doesn't take much product at all to get great colour payoff! 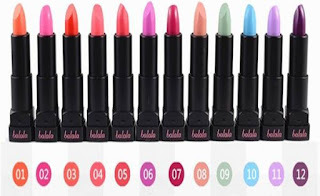 If you compare the pictures of the lipsticks with the swatches, both on and off the lips, you can see that the colour once applied matches the colour in the tube. In my opinion, they are just as pigmented as the Mac lipsticks that I own, so thumbs up for the colour payoff. Are they longlasting? They are on the side of being a more longer wearing lipstick, but they definitely aren't liquid lipstick status in the longevity department. They don't really stay on after eating. A little bit of colour remains, but it definitely does not have it's full opacity after food. Personally, I prefer wearing fairly long lasting lipsticks like this and topping up in the day than wearing a liquid lipstick. I really hate that bone dry, velvet like feeling on the lips that liquid lipsticks give. The thought of it makes me cringe! So I do like these lipsticks for their fairly good longevity. Are they waterproof? Well to test this out, I just went to the sink and splashed my lips with water and smacked my lips together a few times and the lipstick held up surprisingly well! Now, again, I wouldn't say that it has the lasting and waterproof staying power that a liquid lipstick has but, for a lipstick, it is fairly waterproof. I can take a drink with only a tiny bit of a lipstick rim remaining on the glass. I can also kiss my hand with next to no lipstick transferring! What? For a lipstick of these colours, I think that's incredible! Are they glossy? The short answer: not really. But to be honest, if a lipstick is fairly long wearing, I don't really think you can expect it to be uber glossy. At least not for this price range. But just because they aren't glossy, it doesn't mean that they feel uncomfortable on the lips. Their formula is actually very creamy, which makes them very easy to apply and very comfortable to wear. They aren't dry at all so they don't accentuate any lines on the lips. I would say that they have a demi matte finish. If you do want that glossy look, just pop a clear gloss on top! Overall, I love these lipsticks! Their best qualities would definitely be their pigmentation, their fun colour range and how comfortable they are to wear them. For the price, I can't recommend these enough. You can purchase yours here! And don't forget guys, if you like the look of these products, I have my very own coupon code for you! Just enter the code SZH10 at the checkout to get 10% off and free shipping! 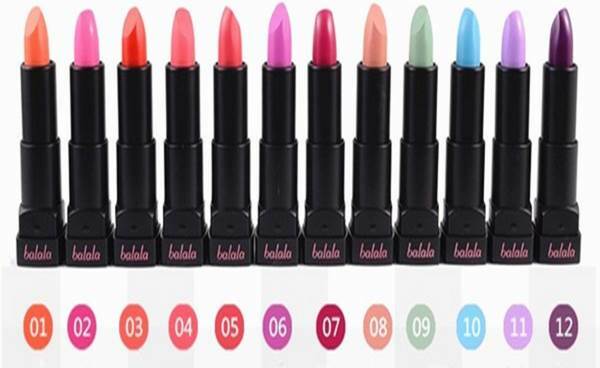 So you can get these lipsticks for an even more affordable price! How great is that? And the good news doesn't just end there... If 10 of you guys purchase products using the code SZH10 at the checkout, then the Born Pretty Store will be running a giveaway with me that is open to all of you guys. How incredible is that? Honestly guys, this is such a great and affordable company, so make sure you go check them out here! Disclaimer: These products were sent to me but all opinions I have written about are entirely my own. I tested these products out for a few weeks before posting this review to check I was entirely happy with them, as I would never endorse a product I didn't love. Oh wow! I love the purple!! These are such pretty colours and the pigmentation looks amazing :) I think I definantely need that blue colour lipstick in my life. You should definitely try them! For the price, they are incredible! The blue is gorgeous, I've never seen a lipstick colour like this! Such gorgeous colours!!! I especially love the look of that purple!!!! Great review, I'll be checking out born pretty now!! It's a really great store! Happy shopping! Don't forget to use my coupon code SZH10 for a 10% discount and free shipping! Congratulations on your first collaboration post! Great informative post! The pigmentation of these lipsticks looks amazing! Thank you! The pigmentation is incredible for the price! Thanks for all the info hon - being a purple fanatic, I MUST have this lipstick! You should definitely try it! Remember to use my coupon code for 10% off and free shipping! They are brilliant! They have both funky shades and wearable shades!